The small UK game developer has had a couple of knockouts on the XBLA platform. Smaller platforms like Xbox Live Arcade have made great inroads introducing small or independently produced games to a larger audience. PC games used to be the only market where such games could see the light of day, but a small game house from the Isle of Wight in the English Channel has had great success on XBLA. 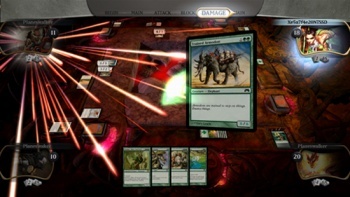 Stainless Games reported today that Magic the Gathering: Duels of the Planeswalkers has been purchased and downloaded 500,000 times since it was released in 2009. That figure only includes the basic game which costs 800 MS points ($9.99); there have been two expansions sold for 400 points each that have also done well. In addition to the Magic tie-in, Stainless Games also found success with last year's Risk: Factions. Matt Edmunds, chief operating officer of Stainless Games, hopes to translate that success to bigger titles on more platforms. "With our multiplatform technology, we'll be hoping to emulate the success of Duels for other brands on everything from an iPhone to a high-end PC and keep up our track record of at least one no. 1 [game] per year," Edmunds said. Stainless Games is working on a Magic game for PlayStation Home, but it's not clear if it's a port of Duels or a new title. Continuing the spread of the Magic brand is important for Stainless but also for Wizard of the Coast, who've told me that the XBLA game was a big reason why the paper card game has had a surge in popularity since 2009. I have to admit that I'm rooting for Stainless Games to do well, as I enjoyed both Duels of the Planeswalkers and Risk quite a bit and the team excels at making strategy or thinking games with a very accessible interface and art-style. Perhaps it's that scenery on the Isle of Wight.